One of the most appealing features of any of the new Tesla vehicles is its gorgeous 17-inch dashboard screen. The car's infotainment system is equipped with a fully functional web browser. Quantcast conducted a study trying to find out what drivers actually browse for in their cars on that large screen. The results of the study were released recently. Data for a 30-day period from February 24 to March 23 was analyzed and this is what they found. The data used was obtained from websites that use Quantcast Measure for their audience management. 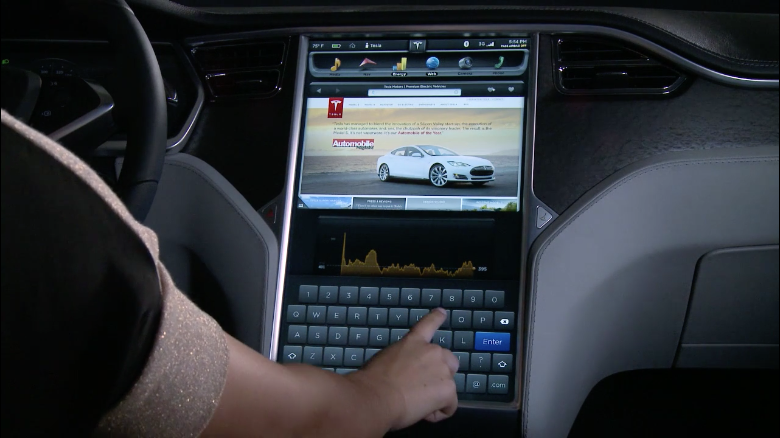 The Tesla browser uses a user agent similar to to what Chrome and Firefox browsers use. Data for all visits to measured websites from the Tesla browser were looked at. As one could have guessed, traffic from Tesla browsers peaked during normal commute hours - 7:30 a.m. to 9:30 a.m. and 4:30 p.m. to 7:30 p.m. The most common type of websites accessed in the car were news sites which made up more than half of all traffic. After news sites, service sites came in second. These included sites related to restaurants, entertainment purchasing services, auto-related services, real estate, travel, and shopping. Entertainment and lifestyle sites followed. About 13% of the news consumed was financial news. Interestingly, the conservative news aggregation site, the Drudge Report, accounted for 10% of overall web traffic. 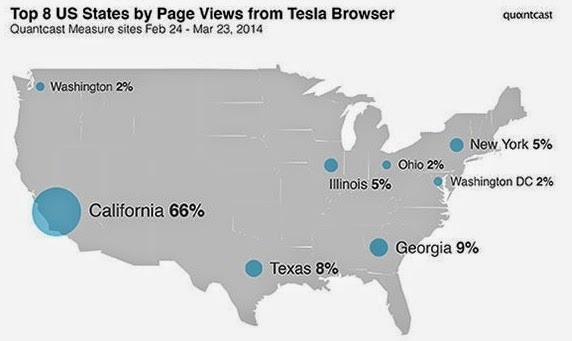 Geographically speaking, California had 66% of Tesla browser activity, followed by Georgia (9%), Texas (8%), and New York & Illinois (5% each). California has laws in place that restrict drivers from viewing a television receiver that is mounted at any point forward of the back of the driver's seat. New York, Illinois, and Texas have similar laws, while Georgia doesn't have such restrictions. However, there are exceptions to the laws when it comes to dashboard or windshield mounted screens that are designed to prevent drivers from viewing them. With media content being available in cars these days that could potentially be distracting, the fine line on whether larger screens (or screens at all) should be allowed in dashboards keeps getting murkier. The National Highway Traffic Safety Administration (NHTSA) has guidelines in place on how such content should be used or viewed in a car. Text, for example, should be read only when the car is not in motion.